UCLA sophomore Guilia Piscitelli spent five weeks in Peru last summer, where she interned with Mosqoy, a grassroots organization that works to empower rural Quechua populations in the Andean mountains. This article is part of a series published in advance of International Education Week 2018 (Nov. 13-16, 2018) that illustrates the educational and career benefits of international experience — whether travel study, study abroad or international internships — among UCLA students and alumni. UCLA International Institute, October 15, 2018 — I arrived in Cusco on August 12, 2018 with the expectation that, like my previous internships and volunteering, it would be a resumé-building experience: I’d be assigned insignificant tasks in the office and, if I was fortunate, would gain a slightly deeper knowledge of international development. By the end of my first week, all of these expectations were thrown to the curb. I realized how truly invaluable this experience was going to be and how much I was going to learn if I opened myself up to the opportunity and invested all of my effort into my work. As a student of International Development Studies (pre-major) at UCLA, nothing in my educational career thus far has given me as much invaluable knowledge as my five-week internship with Mosqoy. * It has only solidified my desire to pursue a career in international development by making me realize how exciting, challenging and rewarding this work is. Below are a few of the invaluable lessons that I learned during my time at Mosqoy. There is no magic bullet that can solve the world’s problems. Successful international development projects require multifaceted approaches that work to empower communities to overcome the complicated, interwoven barriers that they face. Mosqoy addresses the plight of the Quechua communities through many different pathways. Primarily, it provides scholarships to promising Quechua youth so that they can gain skills that they then bring back and share with their communities. This strategy addresses a major issue: lack of access to secondary education among Quecha people in Peru. Mosqoy also buys textiles from Quechua weavers, helping to revitalize the cultural practice of weaving while providing communities an economic development opportunity. Lastly, Mosqoy provides “Field School” tours for students from Canada to educate them about sustainable tourism and consumption. Patience is SO important. Lifting a community out of poverty requires tireless effort and a whole lot of patience. You are working to overcome hundreds of years of racism, oppression and inequality that created the poverty in the first place. Mosqoy has been working with some Quechua communities for more than a decade and there is still much work to be done. Despite slow progress, the organization’s staff dedicates themselves to their work with unending motivation and hope. You need to celebrate small victories. International development work is hard and progress is slow. When a goal is met or a community achieves something remarkable, you need to take the time to celebrate that victory. If not, you will easily burn out and lose your desire to continue doing such challenging work. There is really no small victory. When a community increases its sales or a student receives a scholarship, lives are being changed and progress is being made. It’s important to step back and recognize that changing even one life for the better is something worth celebrating. Consent and open communication are extremely important. One of the biggest quarrels that people have with international development and foreign aid projects is that they often seem to take the form of modern colonialism: western actors enter a developing country and implement development projects without consent. Far too often, development agencies fail to adequately communicate with the communities they are trying to help, leading to the projects that are harmful, useless and/or unsuccessful. 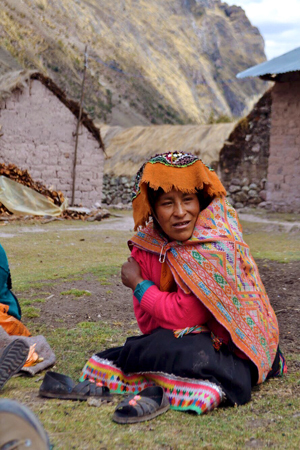 Mosqoy is partnered with five Quechua weaving communities and visits each one once a month. In order to access these remote communities, Mosqoy team members ride in buses, hitchhike on the back of fruit trucks and hike for hours. They do this solely for the purpose of maintaining open and frequent communication with the weavers. Not only does Mosqoy go above and beyond to reach these communities, but they also bring a Quechua translator to communicate with non-Spanish-speaking participants. Furthermore, Mosqoy asks residents for their opinion and input on all big decisions. No projects are implemented and no changes are made until a community agrees to them. There are layers of privilege within even the most impoverished communities; this makes it difficult to provide equal opportunities to all. Within these Quechua communities, I noticed a sort of hierarchy of privilege. By privilege, I mean access to economic opportunities and education. The most privileged community members tend to be men who speak both Spanish and Quechua, can read and write and who have a greater capacity to be employed. As you can imagine, the tiers of privilege go on until you reach the base tier, which appeared to consist of illiterate women who speak only Quechua. When Mosqoy works with Quechua communities, it must ensure that its projects and meetings are accessible to everyone. This takes extra time, patience and effort, but makes a big difference for a community’s less privileged members. For example, a team from the grassroots organization spent nearly five hours at a meeting in Cancha Cancha last summer to ensure that the illiterate weavers, who speak only Quechua, could understand the textile orders requested for the coming month. That meant the weavers had to memorize the measurements, colors and number of items. It took a great deal of time, but the process was fulfilling when the women felt confident that they could create the requested textiles. Passion is more valuable than hard skills. One thing that has really stuck with me from my time at Mosqoy was something the organization’s founder, Ashli, said: “Remember, if we are choosing between a person with the skills and a resumé but no passion, and a person with passion and fewer skills, we should choose the person with passion.” In other words, you can teach someone how to use spreadsheets and edit a website, but you cannot teach them to be passionate about their work. What Mosqoy seeks to achieve is much more challenging than I ever could have fathomed. Not only does it run a business from its office each week, but the staff make monthly hikes to Quechua communities, attend weekly fundraisers and run meeting after meeting. The Mosqoy team seemed to never stop advocating its causes, doing fundraising or working in the office. I felt the same way during my time here. For me, the moral of the story is that international development work is hard, but if you’re passionate about what you are doing, it is unbelievably fulfilling. * Julia found the internship at Mosqoy through the “Intern Abroad HQ” website, which pairs a student with a host family and an internship in the country and field of their choice. A slightly longer version of this article was previously published on Guilia Piscitelli's blog.